Summer is in full swing and we wanted to send a special message to all of you, wishing you a Happy 4th of July! 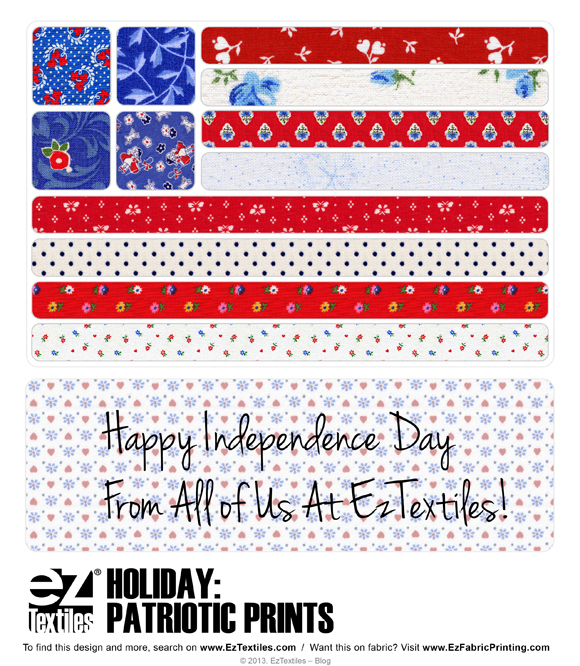 Check out these red, white and blue prints from EzTextiles and click the picture to see the entire collection! Wouldn’t it be fantastic to be able to create a quick mood board for each season or holiday? With EzTextiles you can quickly build a whole collection in minutes! Found a color you love? Lock the color chip and do another search! Your results will ALL include that color! Click here to see the full collection! This entry was posted on Wednesday, July 3rd, 2013 at 11:51 am	and is filed under EzTextiles, Holiday, Inspiration, Mood Boards. You can follow any comments to this entry through the RSS 2.0 feed. You can leave a comment, or trackback from your own site.